Below, we’ve provided a quick comparison chart that we’d like you to share on Facebook or Pinterest to help get the word out about an important issue that most people (including most gardeners) don’t know about. Nature vs Nurture or Nature and Nurture? Over the years, we’ve grown hundreds of varieties of fruits, herbs, vegetables and grains. Regardless of what we’ve grown, we’ve always used an organic/permaculture approach, which requires a greater understanding and focus on the overall system rather than a reductionist fixation on the components operating within the context of the system. Part of our edible “food forest.” Despite their ancient origin, food forests (aka “forest gardens”) are considered to be the most sustainable, biodiverse and productive agroecosystems ever devised. Every part of the system serves multiple functions for multiple species, in addition to producing delicious, wholesome food for people. That’s a fancy way of saying the health and productivity of a specific plant is less about the actual plant and more about the growing environment the plant is in. In our opinion the DNA of a particular plant is part of the equation, not the solution to the equation. If a farmer or gardener takes a biomimicry, systems-based approach to food production, that does not mean that the components (such as plant genetics) do not make a big difference. They do. How and how much is a matter of debate and depends on a wide range of factors. 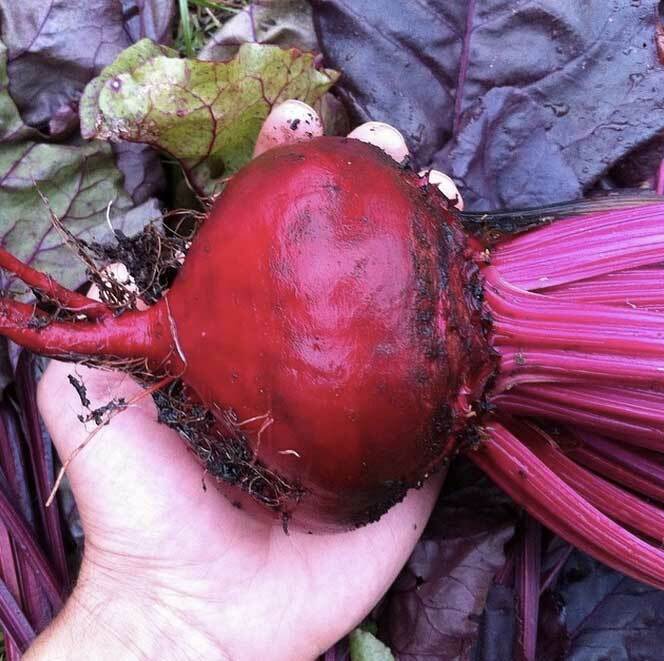 A beautiful heirloom, organic beet harvested from our front yard. Is the performance of this beet plant due solely to its DNA or is the equation of life more complex? We recently read an interesting article on CNN about the environments/communities around the planet that give rise to the longest living, healthiest people on earth. In certain areas, people live well into their 90s, have virtually no mental or physical diseases/illnesses and lead happy, productive lives up until the day they die… And they do this without taking closets full of pharmaceuticals or having heart surgery every few years. The article states that medical scientists generally believe that 75% of your health and longevity is due to your environment, and the other 25% is due to genetics. Yes, you are much more than your genes. Yet still 25% of a plant’s health and productivity is going to come from biological aspects innate to the particular plant. That’s significant: a quarter of the pie. As we’ll discuss, the broader equation is something like this: the plant’s genome (DNA “hardware”) plus the plant’s epigenome (the “software” that controls DNA expression) operating in and responding to the plant’s growing environment will determine the plant’s overall success (health, yield, etc.). Interestingly, the plant then passes on information to its offspring to help them grow better in the same environment. 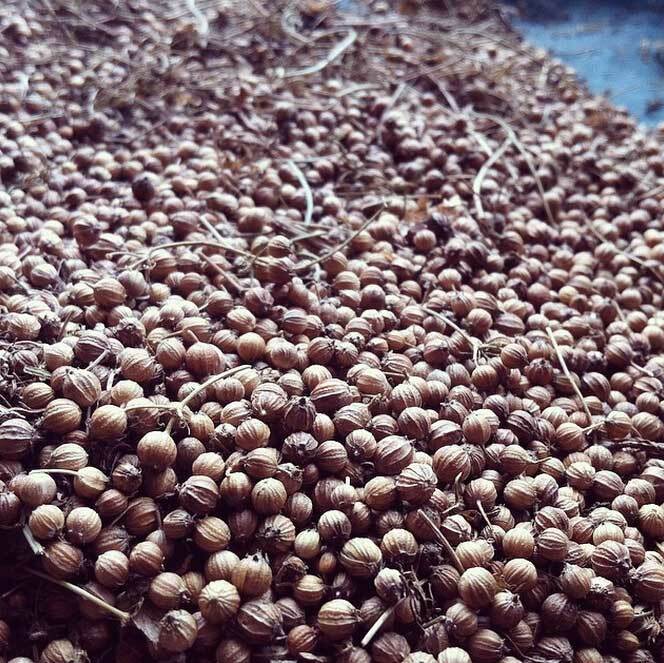 What is an organic seed? 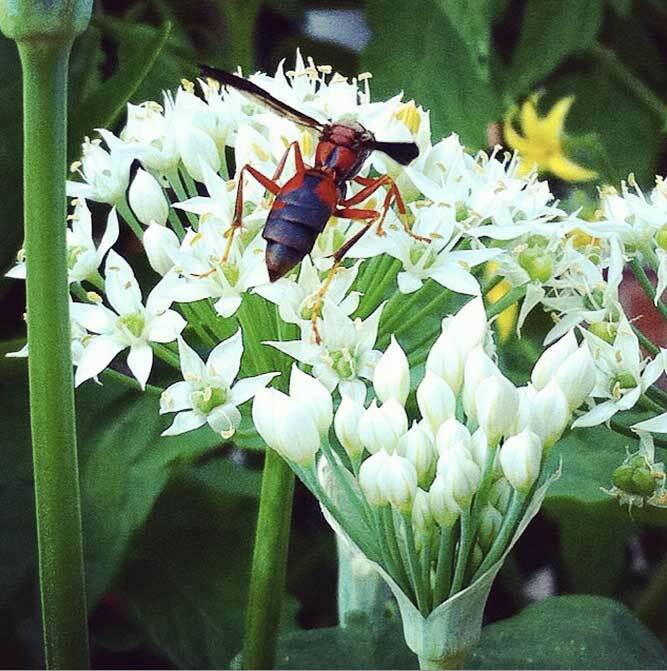 A paper wasp foraging pollen on our chive plants. Paper wasps are wonderful pollinators and hunters; having insects that serve both roles are essential for a healthy organic garden or farm. Like other beneficial insects, wasps are easily killed by insecticides. All USDA Certified Organic seeds were grown in/on a USDA Certified Organic growing environment/farm. Not all organic farms are the same. Some look like conventional farms, they just use organic/OMRI listed pesticides and fertilizers. Others look nothing like a conventional farm and use no pesticides or fertilizers other than the ones grown and produced naturally on-site. And plenty of organic farms fall in between these two paradigms. They are heavily regulated by international and national organic policies/entities to encourage practices that are both sustainable and safe (to soil, ecosystems and people). They are inspected by independent third-party regulators to ensure their actions match their promises and adhere to the organic standards. They are NOT allowed to use synthetic fertilizers (which degrade soil), synthetic pesticides that cause a huge array of environmental and human health problems, or treated seeds (one popular class of seed treatment is neonicotinoids, a systemic insecticide that over 800 peer-reviewed studies have shown can kill bees and other wildlife even when used as recommended by the manufacturers). The way your seeds were grown doesn’t just impact the environment, it also has a very real impact on the quality of the seeds you buy and the quality of the plants you’ll grow from them. Crops grown for seed must go through their entire life cycle before they can produce seed. This means they’re in the ground longer and susceptible to more (and more varied) pests and diseases than food crops. Since seed crops are not intended for human consumption, they’re also not subject to the same regulations and restrictions as food crops. For these reasons, pesticides are applied to conventional seed crops at a much higher rate than conventional food crops. And the more broken the growing environment (example: ravaged lifeless soil planted in monoculture), the more inputs must be added to replace the functions that the environment is no longer able to perform. This is bad news for farmworkers, families living near the farms, communities the farms are in, nearby bees, birds, amphibians and other wildlife, etc. Oh and it’s bad news for the water you drink (and swim and fish in) plus the air you breath. This stuff impacts you, even when you think it doesn’t. It impacts us, too. Please care. Hornworms are herbivorous “pest” insect that are loathed by most gardeners and farmers. We happen to love them. For one, they’re our Welsh Harlequin ducks’ favorite summer snack. They’re also food for our predatory insects. 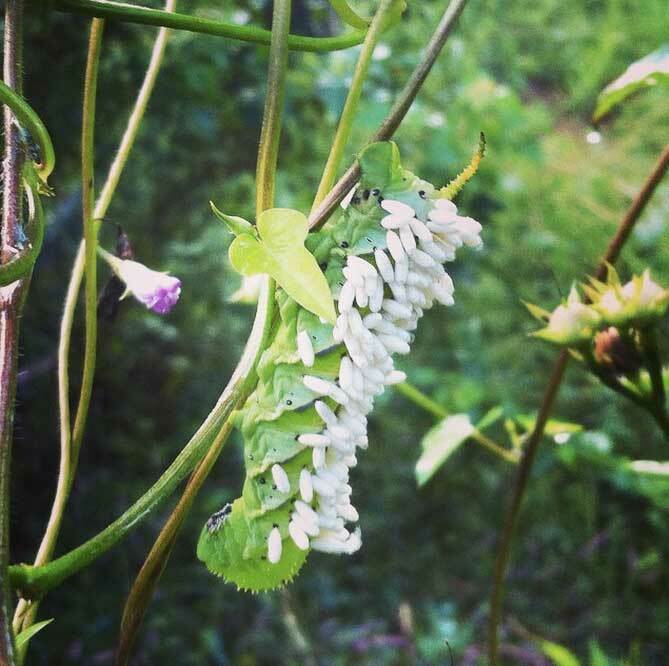 The hornworm in this picture has become colonized by our parasitoid wasps (each small white cocoon contains a wasp larvae). No prey = no predators. Remember: insecticides don’t discriminate between prey or predator. Organic farmers (including organic seed producers) are required to deal with plant pests and diseases through an integrated pest and disease management approach. They understand that plant pests and diseases are almost always the result of soil imbalances or poor plant system design (monoculture, not rotating crops, etc). So, rather than treat symptoms with poisons that cause more longterm problems, they instead focus on the source problem, e.g. creating and sustaining a healthy overall system. If they do have to take corrective action, they will do so using only those methods or applications that are approved by the National Organic Program (NOP). Organic gardening and farming offers a better, safer, more sustainable approach when dealing with complex ecosystems, wherein a single component of the system such as a teaspoon of healthy, living soil can “contain up to one billion bacteria, several yards of fungal filaments, several thousand protozoa, and scores of nematodes,” according to nematologist Kathy Merrifield of Oregon State University. And we still don’t understand the role and function of all of these microorganisms. 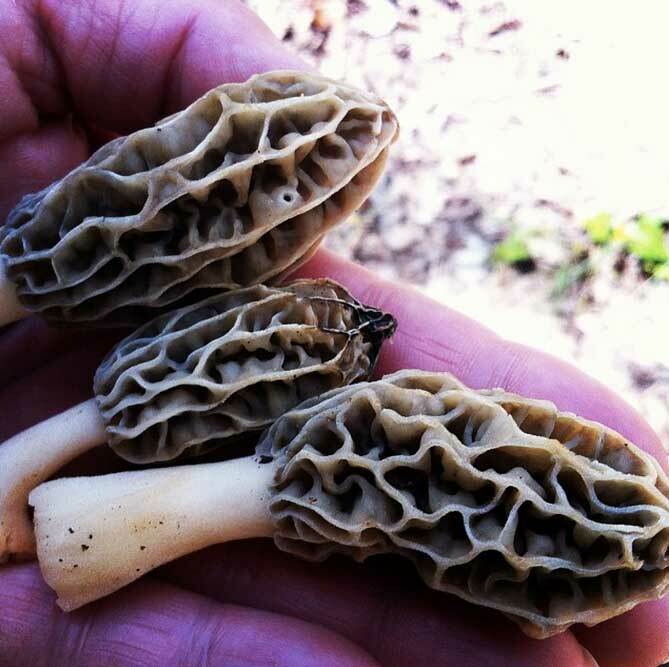 Morel mushrooms, perhaps the most prized culinary mushroom in North America, is a mycorrhizal fungi that forms symbiotic relationships with certain types of trees such as Tulip Poplar, Ash and Elm. One thing we’ve noticed (albeit anecdotally) over the years is that our best-performing seeds are either organic seeds we’ve bought or organic seeds we’ve produced ourselves. Now, this isn’t for any woo-woo reasons like a us hiring a wizard to cast a magic spell that imbued our seeds with happy energy. We think science is beginning to uncover the answers that explain our observations. Cilantro seeds we saved from 2014. Like many other seeds, each cilantro seed can feed you a pile of fresh, nutritious food before producing copious amounts of seeds that are programmed to grow better in the environment their parents experienced via natural epigenetic processes. Like people, plants have microbiomes and form complex symbiotic relationships with a massive array of microbial critters above and below the soil surface that protect and feed them and receive protection and food from the plant in return. Just as imbalances in human gut flora can manifest in a wide range of human diseases and illnesses, imbalances in the equally dynamic, living systems of plants can also lead to the emergent result of poor plant health/performance. Many gardeners don’t realize that if you spot a bug eating your plant and you spray the bug with poison, you don’t just kill the “bad” bug, you also kill the “good” bugs that could potentially eat the bug (not to mention the microbial life on the plant). Imagine if you removed all the herbivores from the African Serengeti; what do you think would then happen to the lions and other predators? Yes, predatory insects need food (including herbivorous insects) in order to predate. The same relationships are true in “bad” and “good” soil fungi, bacteria, nematodes, etc. Our soil is alive and we treat it as such. Vast underground fungal networks give our plants a “second root system” for increased water and nutrient uptake, while also linking the plants into a vast interconnected system (the mycelial web) that grows stronger and more resilient over time. Each season, different mycorrhizal fungi in this network will “fruit” in order to release spore and reproduce. 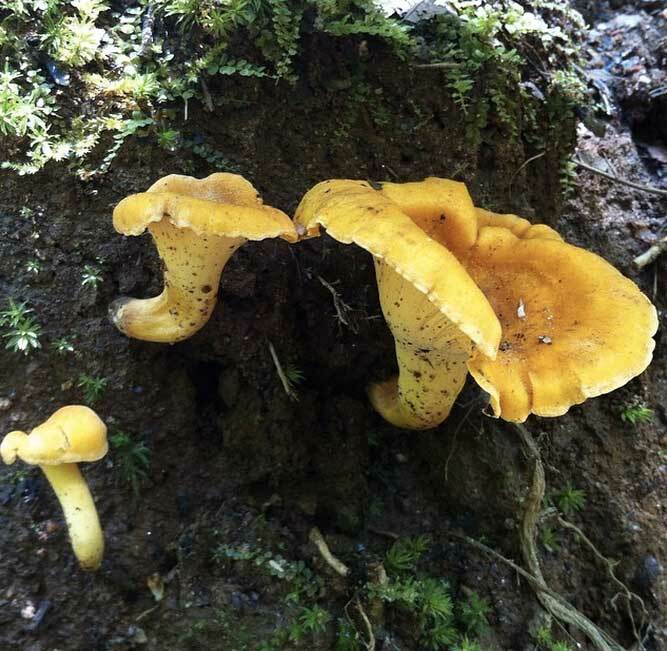 Another nice result of this process: we get to harvest delicious gourmet mushrooms, like these chanterelles. As it turns out, plants also have remarkably adaptive immune systems that are responsive to their growing environments. Plants even “communicate” with each other and send out “pest alerts” so that other nearby plants immediately rev up the amount of pest-fighting chemicals in their cells. Plants also share information and nutrition via extensive underground fungal networks (it’s like a biological internet). 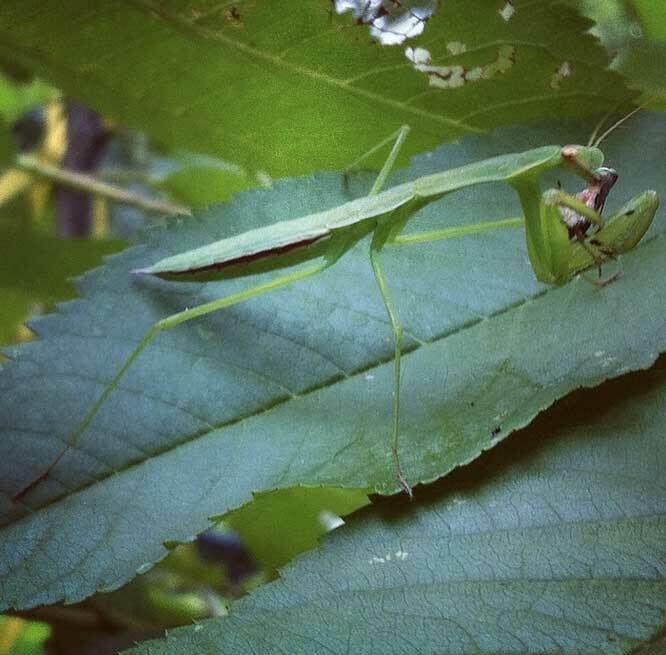 One of our favorite biological pest control agents: a praying mantis. If we spray their food with insecticides, we kill them too, setting off a chain reaction of deleterious unintended consequences that will leave our ecosystem in a state of disequilibrium. Of course, all of these interactions require that you allow your plants to have exposure to good and “bad” insects rather than killing them all with insecticides or that you allow the mycorrhizal root-fungal networks in your soil to develop rather than destroying/disrupting them by plowing them into oblivion and spraying them with fungicides. Unless you’re a farmer, you can NOT buy genetically engineered seeds (aka “GE” or “GMO”). Let us repeat that: there are no GMO seeds available to home gardeners. As Dr. Doug Gurian-Sherman, Director of Sustainable Agriculture and Senior Scientist at the Center for Food Safety points out, it currently costs an average of $136 million to produce a single GE trait. You’d have to sell a lot of gardening seeds to recoup a $136 million investment, which is why no biotech companies are currently making that kind of investment into the home gardening sector. Instead they’re focused on the “big dogs,” large conventional farms who are running fast on the chemical treadmill and who buy seeds plus the synthetic chemicals required to grow those seeds as a single patented technology package. These farming operations buy more seeds in one growing season than a single gardener could plant in a lifetime. And any time they buy GE seeds, the farmer has to sign extensive licensing agreements. This is a completely different market and a completely different “technology” than what home gardeners have access to. Are Non-GMO or Open Pollinated Seeds Organic? No. Just because a seed company says their seeds are “non-GMO” or “open-pollinated,” doesn’t mean those seeds are organic. Nor does it mean the seeds are untreated. So why do we and other gardening seed companies say “non-GMO” on our labeling and website? Because people are rightfully concerned about what’s in their food and how it was grown. As such, we get lots of inquiries from prospective members as to whether our seeds are non-GMO. Rather than answer 100 emails each day, we just put that info on our website and seed packets. Again, no GE seeds are currently available to home gardeners. But that doesn’t mean you don’t have GE genes in your non-GMO seeds. This brings up another big difference between USDA Certified Organic seeds and conventional, non-organic seeds: genetic integrity. Have you ever heard of the Safe Seed Pledge? Yep, GrowJourney is a signatory and we think it’s a great thing. A lot of conventional, non-organic seed companies have signed on as well. And there’s also the Non-GMO Project, which is attempting to help protect genetic integrity and biodiversity of traditionally bred and/or heirloom seed stocks which can easily cross with GE seeds growing in nearby fields (yes, wind and insects carry pollen far and wide, sometimes many miles). Bigger Picture – They don’t have any ability to encourage or enforce better, more sustainable (or even ecologically regenerative) farming practices. 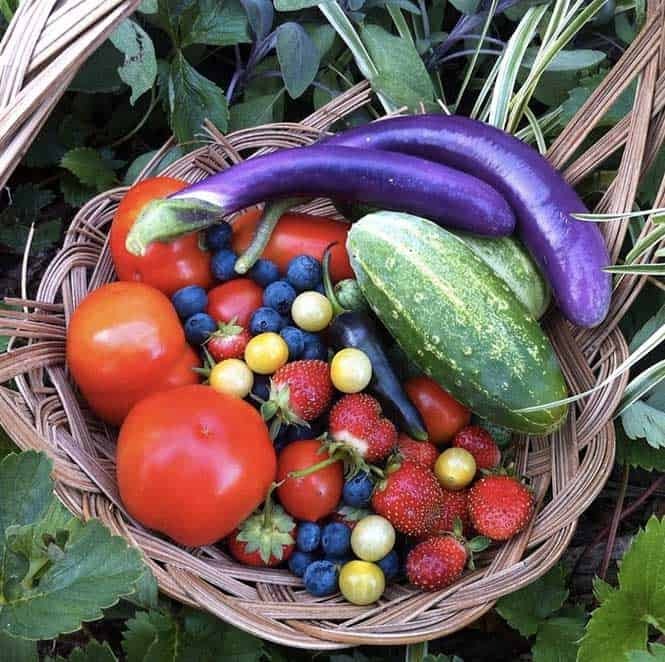 What better use of your yard than to grow a wide variety of delicious, nutrient-rich organic food that feeds you and provides habitat for thousands of other species that we share the world with? If you care about these issues, you’ll be glad to know that the problems mentioned above are both addressed under the USDA Certified Organic guidelines/processes for both food and seed production. “Organic certification agencies conduct residue testing on both pesticides and GE contamination in order to comply with 205.670. Annually, at least 5% of certified operations are tested by the certification agencies. Some certifiers conduct much more residue testing but 5% is a minimum threshold. That said, organic certification is process based. If an operation were to produce organic seeds of a variety that was a risk to genetic drift from GE counterparts then they would have to take into account that threat in their system plan. They could use a lot of different tools to prevent/limit their risk to foreign pollen contaminating their gene pool. Some examples would be isolating the planting from GE counterparts, temporal buffers for pollen dehiscence of the GE crop and the stigma receptive period of the organic crop, and planted buffers surrounding the seed producing crop. As you know, 205.105(e) requires that organic products be produced without the use of excluded methods defined in 205.2 as GMO’s. In 205.201, the regulations require an organic system plan to be developed to meet the requirements in the regulations. Further, in 205.201(a)(3), the plan must describe the monitoring practices used to verify that the plan is effectively implemented and 205.103(b)(4) require that records maintained by the operation be sufficient to demonstrate compliance with the regulations. Using these regulations you can see that, depending on site specific situations taking into account the threat of cross pollination of GE crops, a certified operation may be required to conduct GE testing of their products to verify compliance. If an operation has no threat of GE cross pollination then it may not be necessary to conduct testing to demonstrate compliance. Again, organic certification is process based. This differs from Non-GMO Project certification which is based on an action level of 0.9% GMO. Anything below that contamination level is considered “non-GMO”. Since organic has no tolerance level, any presence of GMO material in a monitoring test would result in compliance action. As far as I know, there is no monitoring required of conventional garden seed production other than voluntary testing or third party verification. For further reading you may want to take a look at PM11-13 from the program handbook. So, if anybody ever tells you that “organic certification doesn’t mean anything,” politely tell them they’re full of, er, manure. 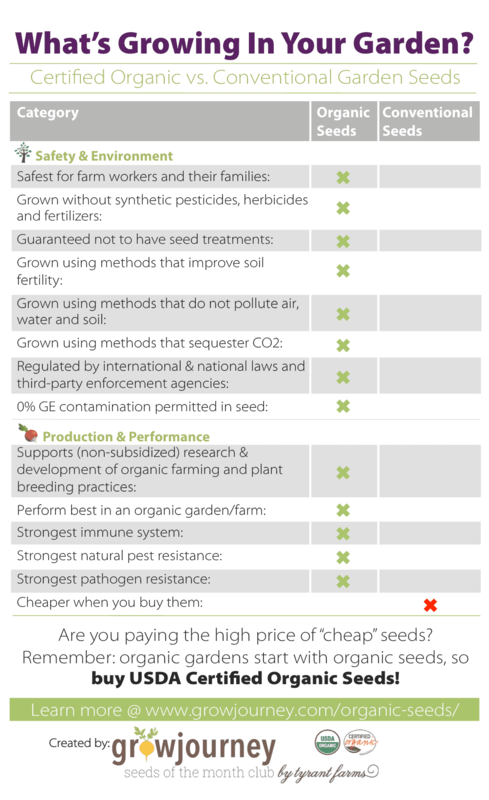 In summary, we want to encourage every gardener out there to get educated and stop paying the high price of “cheap” seeds. If you buy a cheap sofa or a cheap pair of shoes, you know what you’re going to get. Likewise, if you buy cheap seeds, you’re likely to pay for that decision in the form of sub-optimal gardening results and varieties whose genetics may not be true to the label. Not to mention the massive, negative environmental consequences of conventional seed production or the health impact on the farmworkers, families and communities where those seeds are grown. Buying organic garden seeds provides financial support for organic farmers and plant breeders, helping to hasten our much-needed societal transition to sustainable food production. Every dollar you spend is a vote towards the future you want to create. So if you want to have the healthiest, most productive organic garden possible, use USDA Certified Organic seeds in your organic garden. Like us, you’ll be glad you did, and that difference will become more apparent each year as your soil becomes healthier and your garden ecosystem becomes more interconnected, biodiverse and resilient. Now imagine a world where every yard and farm had a similar approach. Let’s grow that world together! 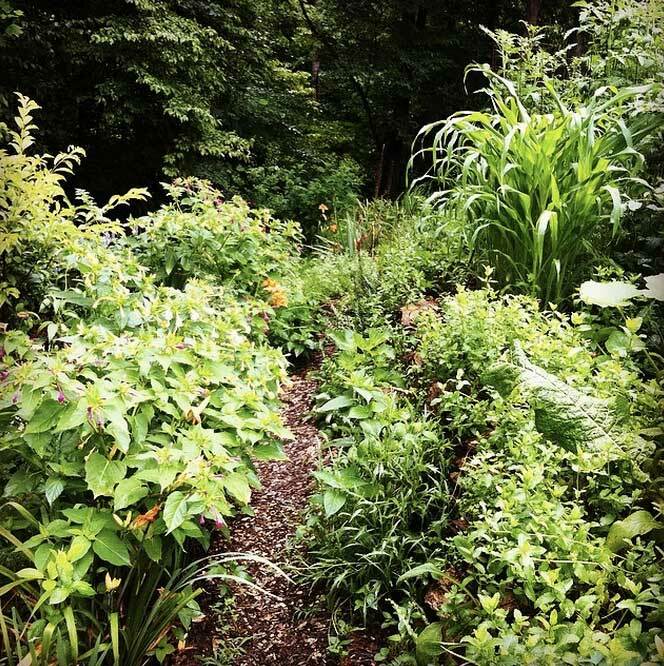 What a thoughtful and compelling article that reminds us that our gardens like everything else are interconnected webs of life. The challenge is to better understand and work with these webs rather than disrupting and even destroying them due to our ignorance or expediency. As organic gardeners, we have a wonderful opportunity, as you so eloquently point out, to observe and appreciate these complex, fascinating, and sometimes frustrating interactions as we work in our gardens to put healthy food on our tables. When we succeed, as your beautiful photos reveal, the rewards are immensely satisfying. Thanks April! Well said. Yes, gardening is as much about observation and education as it is about food production, although the food part sure is nice! I have a question about USDA Organic vs others. How can we trust the USDA when they don’t require GMO labeling? Hi Abby! There’s a lot of consumer confusion out there about how the organic program works and what various food labels mean. First of all, people should know that labels like “natural” and “all natural” mean absolutely nothing, and there are no public or private entities certifying or checking those claims. However, here’s broadly how organic labeling works: First, there are strict international standards around certified organic operations and products that are administered by a wide range of government agencies and private certifying agencies such as Quality Assurance International. This means that if you get organic broccoli in Spain, Japan, or the US, you’re getting the same quality product grown without synthetic pesticides and fertilizers. In the US, organic certification is broadly administered by the National Organic Program (NOP), which operates autonomously under the USDA. (This is similar to how the Navy or the Marines operate under the umbrella of the Department of Defense.) The NOP sets guidelines and best practices for farms and processors, and each operation that participates in the organic program must comply with those guidelines AND be inspected by third party certification agencies. For instance, GrowJourney is certified organic through Clemson University’s Department of Plant Industry and we undergo annual inspections and have to file lots of paperwork to show that we’re in compliance with organic standards. 1. “USDA Organic vs others” – In the US, there are no others. To be an organic operation, you have to do so through the NOP. 2. “How can we trust the USDA when they don’t require GMO labeling?” The USDA is not the NOP, just as the Navy is not the Department of Defense. If you’re concerned about consuming GMOs, pretty much the only way to avoid those is by eating certified organic foods/beverages, which strictly prohibits their use. In a sense, GMOs are labeled in the US – if you’re getting a processed food product in the grocery store that is not certified organic, it’s very likely to contain GMO soy, corn, or canola. Very little of the commercially available, non-organic fresh produce you’d buy at a grocery store is GMO at this point, outside of papayas, flavor saver tomatoes (which taste awful), and a small handful of others. The main human health concern with conventional produce is pesticide contamination (Environmental Working Group has a great list to help consumers make decisions there), which is especially problematic for pregnant women, children, and adolescents. If you want to read more about what steps the NOP goes through to ensure that GMOs are not getting into the organic supply chain, please have a careful read through point #3 in the above article. I hope that helps! Please let me know if you have other questions.